Prospect Park aftermath of Sandy.This is about half to two-thirds of the trees that were knocked down; the rest are lying where they fell, waiting to be dragged away. I’ve been up to my neck in family things lately, so I’ve been out of New York for the better part of the past week. That means that when I returned Saturday, I had been away from the continuing upheaval of the fixes having to be made for Hurricane Sandy. First, there’s this–a meteorologist predicting Sandy almost perfectly earlier this year. Then there are the continuing signs of the storm–most of the trees have been cut apart, but there were bucket trucks out, taking down limbs that are looking increasingly precarious. 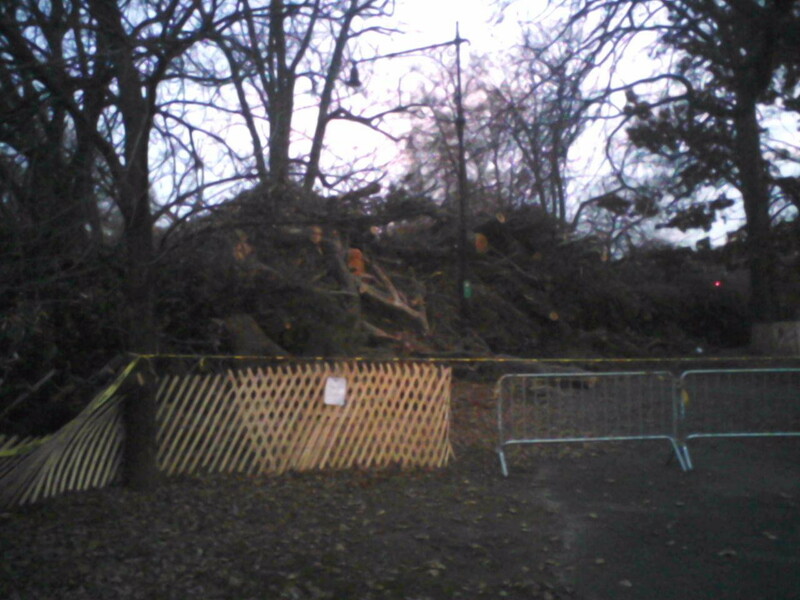 a huge pile of downed trees in Prospect Park. These were being front-loaded into a pile for takeaway. Note the ‘danger’ sign and the scale of the fence. 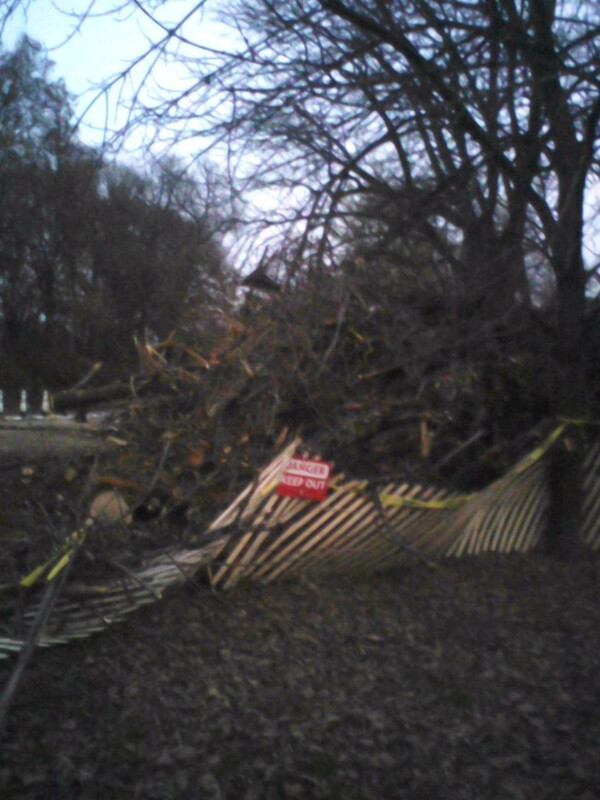 the pile was at least 40′ tall and stretched over 300 feet. A visit to Coney Island earlier in the day revealed a waterline on the buildings not far from Nathan’s hot dog stand that indicates the water was up to 4 feet deep along sections of Surf Avenue. Surf Avenue is mostly a ghost town, with the roar of generators the only sound (Nathan’s was closed, the inside full of equipment covered with the telltale signs of salt water damage). The few businesses that were open are on the boardwalk–places like Ruby’s, a Depression-era bar that has survived gangs and the crack epidemic and even attempts by misguided developers to tear it down. Apparently, the water swept UNDEr the boardwalk and inundated the streets. Meanwhile, the Occupy Sandy website continues to put out tweets for help in various parts of the outer boroughs. Are you free on Thanksgiving?